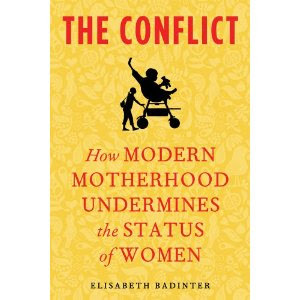 About a month ago, I wrote about Elisabeth Badinter’s upcoming book: The Conflict: How Modern Motherhood Undermines the Status of Women. The book, which claims that the current mania for natural parenting (babywearing, extended breastfeeding, co-sleeping, etc.) is becoming a new form of oppression for women, has been a bestseller in Europe. I predicted that it would cause a huge stir when released in the US. Of course, predicting that any manifesto/screed/polemic about modern motherhood will cause a huge stir is like predicting that the sun will rise in the morning. It’s really a law of nature. Sabrina Parsons of Forbes.com hates the very idea of the book. Just reading the description of the book fills me with anger. I am annoyed that Badinter is implying that the only way to be a “liberal” mother, and not only believe, but implement theories of attachment parenting, is if you are tethered to your home. I’m really glad someone has written this book, even though I expect it to be rejected by people who believe labeling a behavior a “choice” exempts it from analysis or criticism. I suppose it could be a coincidence that lengthy breast-feeding and attachment parenting that interferes heavily with maintaining a career came into style right as it became passé to pressure women to downplay their ambitions for the sake of men, but it just seems highly unlikely. One thing I do know is that the more conservative women of my acquaintance don’t feel the same pressure to breast-feed until their kids are talking or to keep their kids by their side at all times, even bedtime. It seems that if you live in social circles where it’s simply expected that you curtail your professional ambitions and do most of the domestic work so as to avoid emasculating your husband, the psychic need to create elaborate parenting theories to achieve the same result—woman at home, tied to the kitchen—simply vanishes. Strange coincidence, indeed. KJ Dell’Antonia of The New York Times Motherlode blog thinks the book raises interesting questions. If we absorb a message that to breastfeed on demand, to protect one’s children from all dubious chemical exposures, and to take on full responsibility for their physical and psychological health at all times are crucial to our children’s well-being, then does that message also push women away from the work force, and back into the realm of home and family? 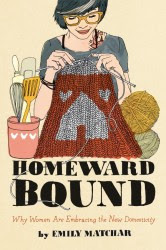 Emily Matchar, of New Domesticity, STILL HASN’T GOTTEN HER HANDS ON A DAMN COPY! I am (sort of) with Parsons. It bothers me that the usual response to the observation that “liberal motherhood” is incompatible with the modern workplace is (for women to) tell women that they should make different choices. So few responses bother to interrogate the modern workplace! Why not ask how we could make working more compatible with these parenting practices? Because the other thing that irks me about many feminist responses to the issue (I’m thinking especially of Amanda Marcotte, whose work I generally admire quite a lot–she’s been on a bit of a tear lately against attachment parenting and its ilk. Not that I am defending placenta eating here!) is that it assumes women only carry out these demanding parenting practices because they have been somehow hoodwinked by the patriarchy into believing they are “better.” Isn’t that line of thinking in itself sexist? Even Parsons takes the technocratic tack–”yes, it was difficult but I thought breastfeeding and cosleeping etc. were better so by gum I made it work.” Personally, I found breastfeeding and babywearing extremely rewarding–emotionally satisfying and physically pleasant. (AND I also continued to find my career of paid work satisfying and rewarding. It’s not either/or!) Why doesn’t that count except to be dismissed as a “choice,” as if I were picking between strawberry and pistachio ice cream? I also part company with Parsons with her contention that employees (women) just need to ask for work to be more flexible/accommodating to parenting. That is an argument that is only ever made by high-up executives at large companies! (Remember the Sheryl Sandberg profile in the New Yorker?) I think there are systemic forces at work here that are not so easy for individual women to push back against. But a cultural shift in thinking about how to combine paid work and parenting would liberate men as well, I think. I feel like asking individual parents to construct a completely different kind of civilization inside their house then they find outside it in response to finding that the civilization outside their house is ill-suited to children is pretty oppressive, yeah. It’s kind of angel-in-the-home-y, isn’t it? Sure, the outside world might be cutthroat and dangerous, but inside the home a single woman is put in charge of fulfilling the entire role of a family-friendly society towards a single infant. A friend of mine said, after trying and giving up a lot of attachment parenting techniques, that she thinks the problem is that attachment parenting details the duties of a mother (and maybe father) towards an infant but doesn’t take on anyone’s duties towards the parents, so it winds up feeling like enormous sacrifice to, for instance, give up your only potential time for spousal closeness in order to co-sleep because there might be someone else who could hold the baby for an hour during the day while your spouse was around.